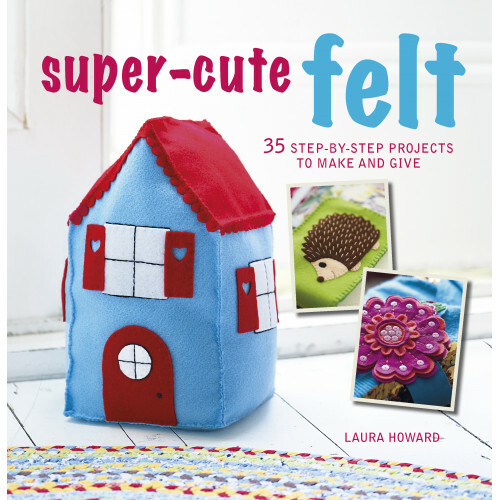 Packed with 35 different projects for you to make, Super-Cute Felt will open your eyes to a whole world of felting possibilities. Split into 4 chapters, there are sections for ‘Accessories’, ‘Gifts’, ‘Homeware’ and ‘Celebrations’, as well as a handy section explaining materials, techniques and equipment. In the ‘Accessories’ chapter you will learn how to sew a Bunny Brooch, a Feather Headband and Butterfly Barrettes, to keep for yourself or to give as great gifts to your loved ones. The ‘Gifts’ section has even more ideas to make and give, with a Hedgehog Phone Case, a Mug Cozy and Cat & Mouse Puppets! Next is the ‘Homeware’ section, which offers lots of suggestions for fun and practical homeware solutions, such as an Owl Egg Cozy, a Teatime Tea Towel and a Toadstool Hot Water Bottle Cover. Finally, the ‘Celebrations’ chapter shows you how to create fantastic festive decorations, like some Birthday Bunting, an Easter Wreath and a Snowglobe Doorhanger. Complete with easy-to-follow step-by-step instructions and illustrations, Super-Cute Felt has a project for all abilities.